I want to talk with you about what it means to maintain peace, equanimity, and authenticity in your walk in the world. 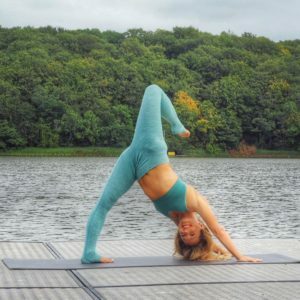 As a yogi, it’s traditionally understood that you are held to a higher standard, which means that, as a yogi, you constantly have to tune back into yourself. Maintaining an equanimeous mind and a compassionate open heart that simultaneously maintains the dual vows of what’s called in Sanskrit, Ahimsa, which means non-violence and truthfulness, or Satya. These two together will help you walk in the world, and truly live the yogi’s life. For it is not enough to only be truthful but you must also be compassionate. And it is not enough only to be compassionate, for you must always be truthful. So, as a yogi in the world, it’s inevitable that you will come into contact with difficult situations, but you always have the benchmark of your daily practice. If you get on your mat everyday it will bring you back into your center, and if you don’t know how to act because you have interacted in the world or been stimulated by negativity, then the yogi’s teaching, or the yogi’s path, is to not act in anger. To not act out of jealously. To not act out of negativity, but instead, to remain calm, to redirect your mind back into the inner body until your mind maintains a calm and equanimous center. And only after the mind maintains a calm and equanimous center then compassionate, rightful action, that is simultaneously truthful and compassionate will be presented to you. And it will unfold almost like light shining on the path ahead. In our last post we focused on the hip abductors and adductors and how they can be used to stabilize the pelvis and synergize flexing the hips in forward bends. In this post we zoom out and look at a technique that can be learned with Chaturanga Dandasana and then transported to other poses to improve benefits and safety. I call this technique “ease in, ease out” and it relates to how one approaches the end point of a pose. For this cue, I take a yoga block and place it at the level of my sternum, then lower down to lightly touch it from plank position. I then straighten my arms to return to plank. The image that body weight practitioners use for this is “kissing the baby” because one touches the block as gently as kissing a baby on the forehead. Working in this manner teaches muscle control and sensitivity. 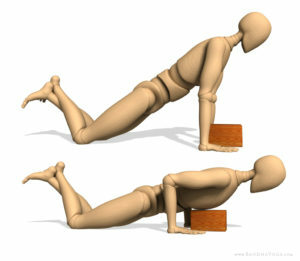 Those who avoid full Chaturanga due to weakness of the muscles involved can develop the strength for the full pose by starting at a wall as shown in figure 2. 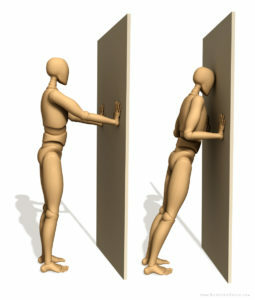 Here instead of the chest touching the block, bend the arms to lower towards the wall and gently touch the forehead, hold for a moment and then straighten the arms. Work in this manner until you can comfortably do ten repetitions. 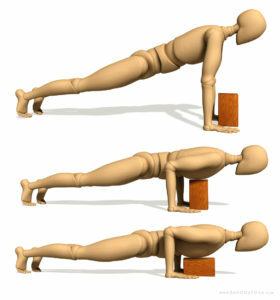 As strength builds, transition to a plank with the knees on the mat, lowering down to touch the block as in the final version. (Figure 3). Visualizing the muscles involved is a powerful adjunct to this technique. Use a mental image of the triceps, pectoralis major and serratus anterior muscles engaging to stabilize the arms, shoulders and chest as shown in figure 4. The triceps straightens the elbows and is a secondary stabilizer of the shoulder joint. The pectoralis major draws the upper arm towards the midline (adduction) and helps to expand the chest (when the shoulders are held in place). The serratus anterior extends from the upper nine ribs to inner (anterior) medial surface of the scapula. It acts in concert with the rhomboids to stabilize the shoulder blades and thus preventing “winging” of the scapula in this pose. (Figure 4). Take a moment to review our post on “co-activating the glutes and abs in Chaturanga” and integrate these muscles into this technique. Also, feel free to browse through the Yoga Mat Companion series. The illustrations in these books are designed to aid in visualizing the muscles in action in a variety of poses. Slowing the movement as one approaches the endpoint of the pose also sets up a cadence or rhythm, especially when working with a Vinyasa Flow based practice. It can be applied to any pose and also to inhalation and exhalation, thus smoothing the breath. It also aids to protect the joints, which have smooth curved surfaces that adapt best to gradual transitions during movement. An excerpt from “Yoga Mat Companion 4 – Anatomy for Arm Balances and Inversions”. Check in next week for Part Three of this series on preventative strategies for lower back strains in yoga. Also, be sure to visit us on Facebook for your free Chakra poster and e-book. Ray Long MD FRCSC is a board certified orthopedic surgeon and the founder of Bandha Yoga. Chris Macivor is a 3D Graphic Dessigner and illustrator who has been involved in the field of digital content creation for well over ten years. This article was originally posted on www.dailybandha.com. 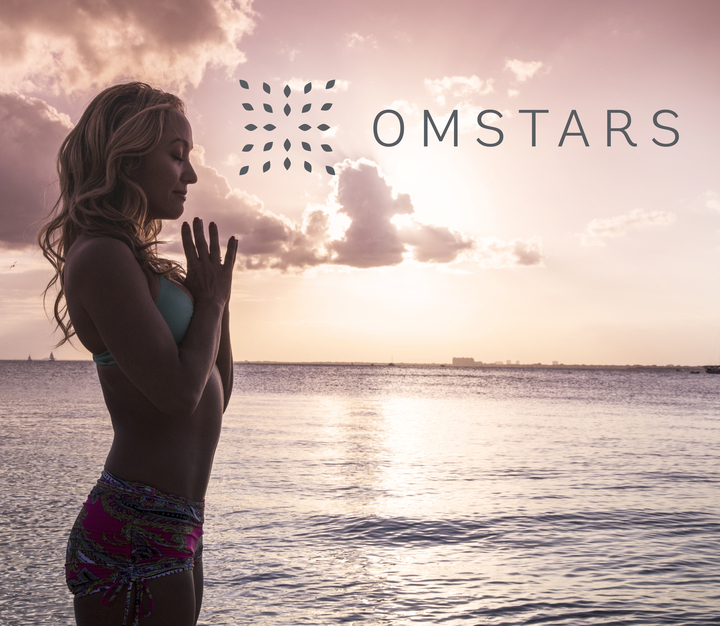 If you would like more practice with Chaturanga Dandasana, check out the tutorials below on Omstars.com. The systematic practice of raja yoga, the “royal” path, consists of three components: tapas (austerity, or going against the grain of our conditioning), svadyaya (self-study, or self-inquiry to understand the conditioning and overcome it), and ishvara pranidhana (the unshakeable faith in the ever-guiding and protecting power of a primordial inner guru, teacher, or guide). Vichara, or self-inquiry, is a Sanskrit term that is loosely translated as “discernment.” It is a systematic process that offers us a methodology for making the unconscious, conscious – a key tool offered by Vedanta which enables us to attain the ultimate goal of stilling the fluctuations of the mind and connecting with the Infinite, Pure Consciousness. As in Jungian psychology, which seeks to bring subconscious process and symbolic content to conscious awareness, a vichara process in yoga helps us to become more intimately aware of these subconscious patterns and tendencies so they can lose their power to seduce and entrap us. Ultimately, vichara is the ability to maintain a continuous awareness on the higher Self, the Paramatman or Ishvara, the untainted Purusha, or Supreme Soul. But in the initial stages, it helps bring us in touch with the higher aspects of our mind, the Buddhi, or wise, intuitive intellect – differentiating it from the lower functions of the mind, known as manas, the survival instincts, citta, the storehouse of all our memories, and ahamkara, the I-sense or ego identity. It is this Buddhi wise mind that gets us closer to that which is beyond the mind: Purusha, the Soul. What situation or thought precipitated your thought or feeling? What is the seed/root desire you need to uncover? We all live with these desires and they “color” our thoughts. They can be caused by samskaras, or past impressions; vasanas, the tendencies they engender; and vikalpas, the false beliefs that only live in our imagination and aren’t inherently real, separating us thus from Vidya. Through disentanglement from the thought forms, pure consciousness can begin to emerge. Higher Self, Soul, Purusha? How our Soul wants to express its purpose in this lifetime? Or our lower self: manas, chitta, ahamkara, or Buddhi? Can you trace it back the desire to when it took root in your life? While not necessary, this question can illuminate the origin of the unfulfilled desire to an event in early life that is still driving us. Does it require adjustment (change something) or contentment (live with it) or both? How do you get rid of the desire that initiated the distress? Meditation uses fire of self-knowledge (jatavedas agni) to dissolve it. It increases our witness consciousness so we can dis-identify with the lower mind. Vyasa, in his commentary of the Yoga Sutras, recommends contemplating the Self/Purusha that is intransient so our awareness of it burns so brightly that it burns away avidya, the sense that the impermanent is real. We can then surrender to the divine, ishvara pranidhana, which connects us to something greater, thus allowing us to let go of outcomes (vairagya). Complete liberation and the end of the search: This is the ultimate gift of vichara. May you be curious to begin the inquiry. 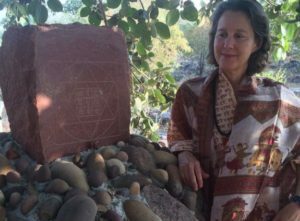 Inge Sengelmann is a somatic psychotherapist and certified ParaYoga teacher, initiated in the Himalayan Tantric lineage of Sri Vidya. ParaYoga is a living link to the ancient traditions of yoga, meditation, and tantra. 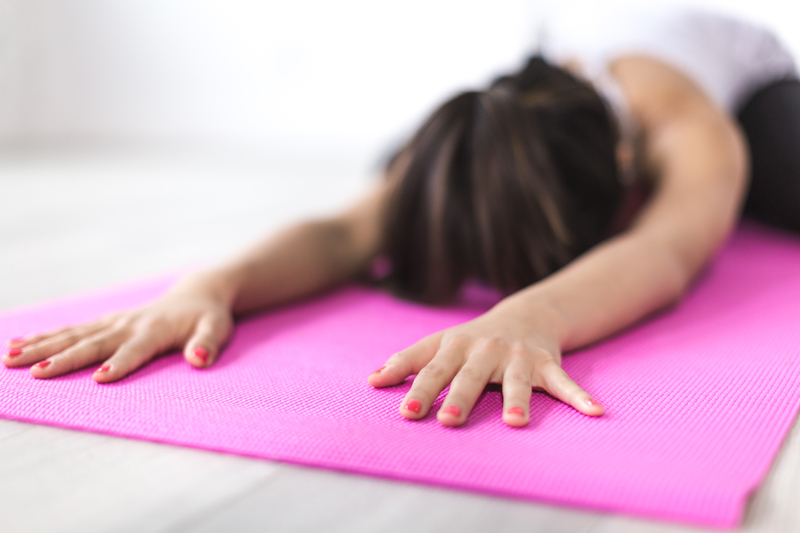 Why do you practice yoga? A yogi is a seeker of the truth. Intention sets the tone for what kind of journey you‘ll have along the path of yoga. Align yourself with the deeper dimension of yoga, practice with a sincere heart, and cultivate an attitude of devotion. Set your intention to know the deepest, most subtle, truth about yourself and about the universe because this is the goal of yoga from time immemorial. The yogis of ancient times in India were human beings like you and me. They were on a quest to directly experience the truth about who we are and why we are here and how this crazy thing called life works. The answers they found are the methodology of yoga that we continue to practice today. We cannot divorce yoga from its spiritual roots. In fact, I think the whole reason so many people are drawn to yoga is that in an age of spiritual vacuousness, rampant materialism and cut-throat capitalism, we have reached a kind of inner boiling point. So many people are hurting and wounded in their bodies and in their hearts and mind. So many people desperately want to scream, but instead, stand silently in shock. So many people show up to the safe and sacred space of yoga to discover the unfelt parts of their own bodies, to finally heal, to learn how to listen and ultimately to directly and personally experience the highest and ultimate truth, the truth that sets you free. If you haven’t asked yourself why you practice, ask. Dig below the surface for the hidden answers and you will find your true self. I practice because practice is prayer, a holy space of worship where I lay down all my heart and all my soul to the temple of the Eternal. I practice because in the quiet space between breath and body, I am free, immersed in the Infinite, replenished, restored. I practice because the simple purity of the seeker’s path keeps me real, humble and raw, it breaks my heart open so that love shines through just that little bit more and makes my world a more peaceful place, one breath at a time. Tantra, defined as that which allows us to expand beyond our limitations, sees the world and everything in it as a manifestation of divinity, and therefore the material, when skillfully utilized, can be a means to spiritual fulfillment and liberation. And because desire is here to stay, we need to discern our Soul’s true desires from instinctual drives in order to be fulfilled and live in alignment with our greatest purpose and fulfillment. Otherwise, we are pulled by our drive for sensory pleasures, often in destructive or non-constructive ways. Through meditation and self-inquiry, you can learn to identify a sankalpa, a resolve or intention, that can move you closer to your overall purpose, or dharma. At any point in your life, one of the four desires will feature more prominently as a focus of resolve. For example, you may wish to have more freedom to enjoy your life (kama), but first you must regain your health after a chronic illness (artha). Lifestyle changes that will give you the stamina to engage in pleasurable activities would be the first step to achieving the desire of kama. Or you may need financial stability, and a secure home, which are also expressions of artha. But change is difficult, and resistance is to be expected. Even when we dare to dream of what we most desire to manifest, the force of our habits and patterns will conspire to hold us back. In today’s world, social media addiction is a perfect example. When we have a free moment, we often click on our devices rather than interact with others or engage in a productive activity to move us towards greater achievement. In my second video, Overcoming the Obstacles to Manifestation, you will learn about the “Creation Equation” and learn to maximize the power behind your intentions, so they can materialize, by agreeing to release an unhealthy habit. Finally, I offer you a tantric meditation to increase empowerment. Through this meditation practice, you can connect to the creative forces of will, power, and determination residing in your manipura or third chakra. Using breathing techniques, visualization, concentration, and mantra, you can create fertile internal conditions to give power to the seed of your intention. 3 Types of Procrastination: Which Do You Favor? Ever wonder why you spend so much time procrastinating, even when whatever you’re avoiding is something you actually want to do? Frances Cole Jones, author of How to Wow: Proven Strategies for Selling Your (Brilliant) Self in any Situation, has a few ideas about procrastination, and today, we’re sharing her thoughts here on the OmStars blog! Read on to see what Frances has to say about our procrastination habits. I don’t know how you’ve been spending your day, but here, I’ve been procrastinating. The Broken Window Procrastination: This one is an extension of an idea put forward by Gretchen Rubin in her excellent blog piece entitled “What are Your Broken Windows?” Based on the police theory that broken windows in a community lead to more serious crimes, she maintains that broken windows are anything in your life that make you feel out of control. My Broken Window Procrastination Theory, takes this one step further: these are activities you engage in that you tell yourself are morally unimpeachable—they are keeping you from feeling out of control! — but they are really various ways of procrastinating. What kinds of things am I talking about? Well, balancing a checkbook, redesigning a website, or cleaning all the bathrooms come to mind…. The trouble with procrastination is that it’s a confidence — and a joy — killer; because no matter how delightful the procrastination activity is that you’ve chosen, you won’t enjoy it as much knowing that you’ve told yourself a fairy story. So, buckle up, dig deep, get it done. I promise you’ll feel better. Now that I’ve written this, I do. Frances Cole Jones is the author of How to Wow: Proven Strategies for Selling Your (Brilliant) Self in any Situation and Wow Your Way into the Job of Your Dreams.